As stated in the last post, I don’t get to see a lot of night lizards. Despite how much time I have spent out in great habitat, this one is the very first that I’ve ever seen, in 2012! I was checking out a mine adit to see if it was being used by any gravid rattlesnakes, and a lizard jumped off the wall in pitch dark near the very end. 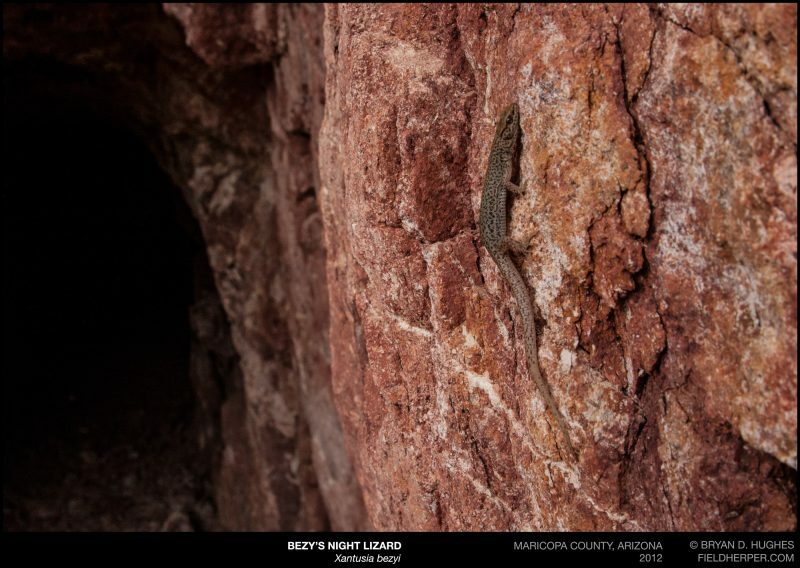 I dismissed it at first, but then looked to see why a side-blotched lizard is in the back of a mine … and, night lizard! This one is fun – when I returned to this area in the summer of 2016, I found the same lizard in the same spot. I had to do some careful comparison to be sure, but I’ve seen this little guy twice now. This may be a routine visit in the future. This entry was posted on Wednesday, December 14th, 2016 at 4:33 pm	and is filed under Lizards. You can follow any responses to this entry through the RSS 2.0 feed. You can leave a response, or trackback from your own site.